Why don’t we eat hot dogs on Thanksgiving? Or a seafood feast? Whether it’s roasted, smoked or fried, with cranberry sauce or smothered in gravy, turkey is synonymous with Thanksgiving in the United States and has even infiltrated various other Thanksgiving feasts around the world. Today, we’re bringing you some fun facts about why turkey is the main food for this holiday and sharing a recipe for Turkey Sobaheg, a turkey stew that has been cooked by the Wampanoag Native American tribe for centuries. The wild turkey (Meleagris gallopa) is native to North America and was a staple in the ancient Native American diet. When the Pilgrims settled in the New World after their arrival in 1620, the Wampanoag tribe may have introduced them to the wild turkey, but there is also evidence that the Pilgrims may have brought with them from England a domesticated breed of turkey that originally came from Mexico. The first Thanksgiving was celebrated in 1621 with the Native Americans as guests of honor, but we have no record that turkey was actually served. Turkey wasn’t necessarily the meat of choice on Thanksgiving. It was President Lincoln who declared Thanksgiving a national holiday in 1863 (see below). Turkey eventually became the traditional entrée when people decided they liked the idea of eating an “American” bird that had supposedly been hunted by the Pilgrims. Sarah Josepha Hale (1788-1879) is called the “Godmother of Thanksgiving” because she lobbied for 17 years to get Thanksgiving declared a national holiday. An editor, author and, interestingly, an avowed anti-suffragette, Hale had a remarkable career and was a leading voice of her time. Read her story here. Why did turkey become a particularly suitable dish for Thanksgiving? Turkeys are big and can feed a whole family. They don’t serve another practical food purpose such as making milk or laying eggs (turkey eggs are not as economic to produce as chicken eggs). Pork seemed too common for a special occasion. By the early 20th century there were very few wild turkeys left because populations had been hunted to depletion and their natural habitats had been destroyed. However, turkey reintroduction programs in the 1940s were so successful that today turkeys live all over the world, including Hawaii, Europe and New Zealand. Contrary to popular legend, Benjamin Franklin did not argue in favor of making the turkey the National Bird of the United States, although, with his typical wit, he did opine on the choice. In a letter to his daughter referring to the eagle adorning the Great Seal, he said that he was glad the eagle resembled a turkey because at least the turkey “was a respectable bird and withal a true original Native of America.” Franklin averred that the eagle is “…a Bird of bad moral Character. He does not get his Living honestly” because he steals his food from other birds. 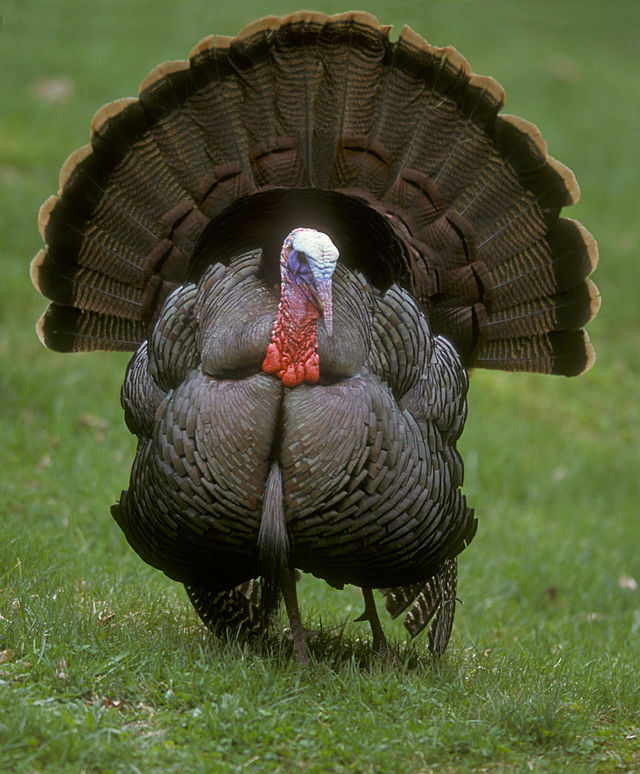 A male turkey’s gobble can be heard a mile away. In 2011, a study by LiveScience said that Americans eat 46 million turkeys on Thanksgiving, which is about 3 pounds per person. So now you know a little more about the fowl in your feast. Use this recipe for Turkey Sobaheg to make sure all of that leftover turkey can be enjoyed for days after the holiday has ended. And for the kids in the family, check out all of the fun Thanksgiving activities at Enchanted Learning. 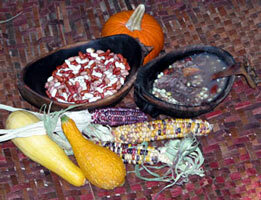 Combine dried beans, corn, turkey, seasonings and water in a large pot. Bring to a simmer over medium heat, turn down to a very low simmer and cook for about 2 1/2 hours. Stir occasionally to be certain bottom is not sticking. When dried beans are tender, but not mushy, break up turkey meat, removing skin and bones. Add green beans and squash, and simmer very gently until they are tender. Add sunflower or nut flour, stirring until thoroughly blended. Stamp, J. (n.d.). American Myths: Benjamin Franklin’s Turkey and the Presidential Seal. Retrieved November 13, 2014. This entry was posted in Blog, Bon Appetit Wednesday, Culinary, Culture and tagged ancient history, ancient recipes, AntiquityNOW, history of Thanksgiving, history of turkey, Thanksgiving, Turkey Sobaheg, Wampanoag tribe. Bookmark the permalink. This was a great article! Why do we eat turnkey on thanksgiving? Thanks for sharing antiquity now!